32 ingredients selected for their optimal bioavailability and absorption. This new formulation perhaps epitomises the best that nutritional supplementation offers in the way of prevention, protection and therapeutic potential. It is ideal for meeting the needs represented by the first level of the SuperSmart nutritional pyramid, and offers a useful alternative for regular users of Daily 3® or Daily 6®, two other benchmark multivitamins. It is an excellent formulation for ensuring a minimum daily intake of micronutrients: all the vitamins and minerals included have been selected for their clinical validity as well as for their optimal bioavailability and absorption. This formulation contains no less than 32 ingredients which are naturally free from all artificial colours, preservatives and known allergens (dairy, fish, eggs, gluten yeast, soya…). How have the forms of vitamins been selected? The vitamin E complex comprises all tocopherols and their isomers for boosting the immune system, and helping prevent cardiovascular problems, Alzheimer’s disease, macular degeneration, diabetes etc. Vitamin A is included with its carotene precursors: the alpha and beta carotenoids, as well as lutein, zeaxanthin and beta-cryptoxanthin. The majority of multivitamins offer synthetic beta-carotene only. Vitamins K1 and K2 (menaquinone 7) help boost blood coagulation and bone metabolism. Particular attention has been paid to the form of folic acid chosen. 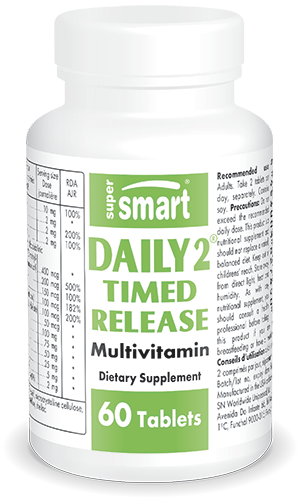 Unlike most available folic acid, the form in Daily 2® is metabolically-active (metafolin L5 methyltetrahydrofolate) and is thus better absorbed and directly usable by individuals with methylenetetrahydro-folate-reductase (MTHFR) polymorphism. The choice of vitamin B12 – methylcobalamine - is a particularly safe, oral form of a nutrient that is recognised for being hard to absorb. As you might expect, this formulation contains vitamin D3, hailed as the new panacea. The 600IU provided per tablet will, at the daily dose suggested, boost levels to those necessary for ensuring bone health as well as for helping to provide multi-faceted protection against cancer, a property extensively studied in recent years. Are there other elements that make this formulation even more exceptional? The minerals and trace elements all have verified bioavailability and validity. Produced using the patented Albion Process (the gold standard), all the amino acid chelates have low molecular weight which helps ensure exceptional tolerance and bioavailability. It contains the complex calcium citrate malate which has been widely studied for its efficacy and excellent absorption. Chromium and organic vanadium have also been included for their physiological activity, widely demonstrated in a number of metabolic and inflammatory problems such as type 2 diabetes and obesity. It is also worth mentioning the addition of rare elements such asNADH, R-alpha-lipoic acid and PQQ. All three are part of SuperSmart’s extensive anti-ageing range, of which the most popular supplement is probably Longevity Nutrients. Finally, we should not forget the major advantages offered by the galenic formulation of Daily 2® Timed Release which enables the tablet’s content to be continually released over time. Whether taken on its own, or in combination with other products, Daily 2® has established itself as a ‘must-take’ nutritional supplement. Other ingredients : calcium carbonate, HPMC, cyclodextrin, stearic acid, microcrystalline cellulose, magnesium stearate, shellac. adults. Take 2 tablets a day.